Log houses come in all shapes and sizes and here at New Forest Log Cabins we realise that no one size fits all, that's why we take so much time to work with you to make your log home unique to you. Our log houses do have one thing in common however, and that is our strict adherence to UK Building Regulations, we supply you with all the drawings for your planning application through to heat and energy ratings for building control. We use best building practice from design to build and an unrivalled passion to deliver the perfect service from start to finish. Click here for further information on designing your log home and see below for inspiration with some examples of our previous work. With over 300 log building and many years of experience as manufacturer of timber buildings, New Forest Log Cabins have changed the way log cabins are constructed. 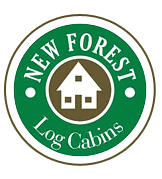 Located in Dorset, New Forest Log Cabins has developed it's expertise in custom log construction, becoming a pioneer and leader in the log building industry. We incorporate elegance with strength and a unique blend of the original Baltic charm with a contemporary European design into our distinguished log cabins. Our sales department are on hand to provide you with a complete design and build quotation. Please contact us for any further information. See below for a list of some of the residential log homes already built by us, or we can create a bespoke design. 3 bed Log House with Galley kitchen / diner and open plan lounge. This is a spacious log house with 3 spacious bedroom and a huge lounge and decked area designed for year round comfort with internal and external dining areas. 3 Bed Log House with Utility Room.